This isn’t your run-of-the-mill coconut smoothie recipe. It features a favorite choice food of mine – a young (Thai) coconut. Recently I’ve been picking up one young coconut a week to blend into a special smoothie on Saturday mornings. That is if I can pour the coconut water into my blender before my girlfriend and I gulp it down. Young coconut water is extremely hydrating and full of electrolytes. The meat is also quite delicious and nutritious. Combine with chocolate and you have a match made in health heaven. Young coconuts may not be accessible to you. You can substitute the water and meat from a regular coconut or use coconut flakes/shreds. This is a pretty basic recipe. Feel free to add additional ingredients to jazz it up. Enjoy! 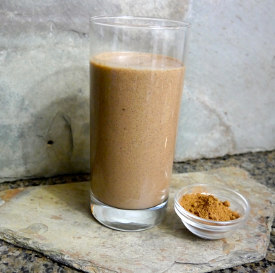 Place all of the ingredients into your blender and blend for around 30-45 seconds or until nice and smooth. I’d love to know if you try this chocolate coconut smoothie and how you liked it. Please leave a comment below. Happy Blending! Hi I have the first seven ingredients and one add on to make your chocolate coconut smoothie.can I still make your smoothie even though I don’t have the cacoa nibs,goji berries,spurulina ,bee polin,baby spinach or kale.will it taste funny or weird if I make this smoothie without these ingredients in it? All of those add-ons are optional. This smoothie will be just as delicious without them. Enjoy!